An enchanting introduction to homeopathy as it has never been made before, offering thirteen selected cases from world-renowned homeopathic physicians, such as Rajan Sankaran and Jan Scholten, which were independently verified. The authors were so dedicated to this task that they travelled around the world in order not to have to rely solely on the therapists’ accounts. They visited all of the cured patients in their homes and let them speak in their own surroundings. This lends an authenticity that has hitherto not existed in homeopathic literature. The authors: A sensitive homeopathic physician and his wife, a journalist, with astonishing skill. 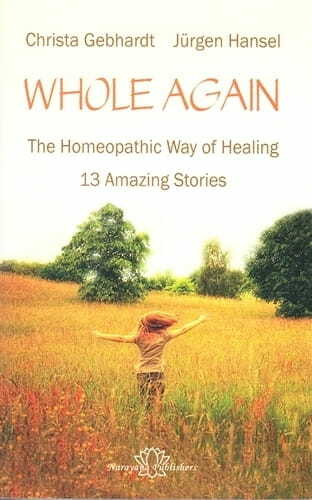 They took it upon themselves to record especially interesting, exciting or touching life stories of patients who all share something in common; they were healed by homeopathy and experienced what this wonderful approach to medicine can bring about - to become “whole again”. What may appear to be simply a stroke of luck in an individual case does indeed prove itself as a method that can be learned. It can thus be understood by the reader how each therapist found the necessary remedy. We become acquainted with people such as the Indian executive, who was partially paralyzed by a herniated disc and was soon able to walk again after a dose of his remedy; Maria, who was born with a handicap but able to perform well in school with the help of homeopathy; a woman from the Netherlands, whose remedy helped her to feel her body again after 30 years of numbness, resulting from a severe burning incident. Yes, sometimes the entire lives of these patients have dramatically changed through homeopathic treatment. The book depicts the entire scope of modern homeopathy and is thus of great current interest. The experienced therapist will also become acquainted with new remedy pictures. A highly interesting work, which is sure to win new friends of homeopathy and which, we hope, will find a wide following! This book has become specially popular in homeopathic waiting rooms. The convincing stories have the power to turn people to homeopathy. Whole Again, translated from German and previously named 'Gliicksfalle?' - Strokes of Luck - refers to what some doctors may like to call cases of spontaneous healing in what seem to be irreversible illnesses. Authors journalist Christa Gebhardt, and her husband, homeopath Jurgen Hansel say: "We want to make the individual approach of homeopathy ... apparent through very personal life stories". So it is that we are presented with thirteen biographies of patients with their unique peculiarities, ultimately leading their homeopaths to a prescription that transformed their lives and led to cure or 'wholeness'. The authors undertook to verify these claims by visiting patients and partners at home, recording how cure came about. Homeopaths such as Jan Scholten and Rajan Sankaran share their choices of prescription with us. Each story is followed by a commentary explaining the prescription in a fair amount of detail; why it was given and chosen over another. Cleverly interwoven within the stories and commentary, the reader will find all the main principles of homeopathic prescribing explained from the law of similars to how provings are undertaken. Explanations of new methodologies are also bravely summarised such as how Scholten uses the periodic table. To help the reader a glossary at the back explains homeopathic terminology. This book is aimed at all readers: from the person who knows nothing about homeopathy, to the professional. The journalistic style makes what is at times complicated thought into readable and more digestible material, and for this style to succeed it is written almost exclusively in the third person. This is where the whole punch of the book misfires. As homeopaths we are used to recording our cases verbatim, and here, where whole life stories are narrated, it felt like a lost opportunity to omit the patient's own words. The homeopaths who worked so closely with their patients also have a behind the screen presence and remain mute. Having said that, most of the stories centre on remedies rarely used; this makes the book highly attractive to hungry homeopaths. It was fascinating to learn about these remedies like Neodymium oxydatum, and equally heartening to read of the relief of severe life-crippling symptoms. A common attack on homeopathy is, that while it may improve mild disturbances such as coughs and colds, it can do nothing for the chronically ill, or patients with pathology. These stories surely counter that thinking. This book was originally published in the German language in 2006 as "Glucksfalle?". It seems that many of the books I have re­viewed over the years have been story books - bedtime reading. I say this because the reading is light yet interesting enough to prevent the eyelids from drooping too often. Such is the case with this book by the German duo Gebhardt and Hansel. They present their "amazing stories" in a well-­produced, quality book of just over two hundred pages. Thirteen cases are presented, each about 10 or 15 pages in length. Certainly all of our cases are not as dramatic or inspiring as theirs but the ones here do serve as fascinating introductions to the possibilities of homeopathy. Some serve as mini-portals into "new wave homeopathy" as the ideas of Scholten and The Bombay Method are offered. These points are not didactically presented but rather woven into the narrative. Case No. 4 - "Lovesick" caught my eye. It concerns Lara, a woman in an unhealthy relationship. She is so desperate for love she permits unusual levels of abuse from her male companion to occur. "A relationship", she will later say, "is some­thing that always leads me to the brink. First I see the sunny side because I think, 'Now it's the right one'. Then I become blinded and play along. But the moment I open up, the destruction begins." - p. 63. "I feel as helpless as a ship in a storm and have no control over my life anymore. I wish I could put my life in someone else's hands." This is Lara's appeal to the doctor. She needs an impetus to rouse her out of her delusion and lead her back to life. -p. 65-66. Continuing, "In this relationship", Lara rec­ognizes later, "everything which had been driving me towards the brink throughout my life came together." - p. 67. The remedy which proved curative was Cypraea eglantina (glantine cowrie, "porce­lain snail"). It was fortuitous that she recieved this remedy as it had only just been proved (in 1997, by Anne Schadde). Lara had begged her homeopathic doctor to try a new remedy and he had just heard of Schadde's work. This is a fine book for both the experienced homeopath and someone with no homeopathic background as the authors weave basic philosophy into their stories. The translation is excellent: the reader whose mother tongue is English will have no problems and will enjoy the flowing text.